Bottle Blossoms are our signature product. They embody upcycling and our drive for community, creativity and sustainability at Upcycle Parts Shop. These colorful flowers have become centerpieces, community art projects, art installations, bouquets and always-blooming reminders in vases everywhereto seek the inherent beauty in everything around us. Bottle Blossoms are available for purchase individually in our shop, in arrangements, and for centerpiece rentals. Perfect for your office or home, wedding or event. Need to recognize a special person in your group or organization? Good, they deserve it! 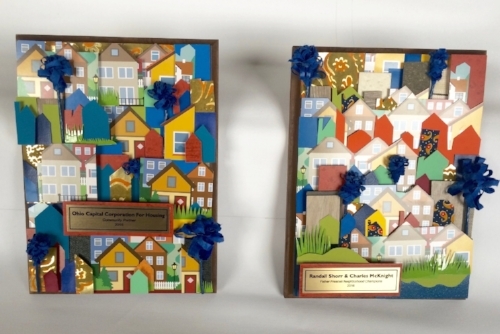 We have handmade awards to fit every budget and style from a funky upcycled trophy to a professionally handmade art piece that can hang on the wall. Our awards don't just recognize, they delight. Proven true! we are a community-based art supply shop, a workshop space with off-site programming and a waste diversion solution all in one. Our mission is to provoke creativity and promote community through reuse. Better than recycling, upcycling is about transforming unwanted materials into new creations with more value. We use donated goods for reinterpretation and we love to connect others to creativity and value in the waste stream.